Over the years, we have helped clients with diabetes, skin issues, and food sensitivities and have seen extremely positive results. Serious athletes have also seen increased levels of performance. The spectrum of people that can be helped is limitless.During Ayurvedic consultations, we assess one’s body and mind to find out one’s strengths and weaknesses. This gives us insight in recommending a diet and lifestyle to suit one’s unique constitution. It does not mean that you would be required to avoid all sort of foods. It just means that you will be educated to make better choices on how, when, and what to eat. Assessment includes evaluation of patient history, pulse, physical and physiological characteristics and main concerns. Recommendation plan given using diet, lifestyle, herbs and Yoga. 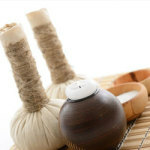 Relaxing warm oil massage given to increase circulation, stimulate the lymphatic system, improve joint health, calm the nervous system and improve skin tone and luster. Shirodhara and AbhayangaShirodhara is most meditative and relaxing treatment in which a soothing stream of warm oil is poured over the forehead and onto the sixth chakra, your intuitive energetic center. It calms the central nervous system and integrates the mind and body. Contact us for more details or visit www.ruggednepal.com for more information on Manish’s experience leading tours.